This year-end holiday travel season will set a new all-time record for the number of travelers in New England, and the U.S., according to projections from AAA. Nearly 4.47 million New England residents are expected to travel at least 50 miles away from home during the holiday period between Dec. 23 and Jan. 2 – a 2.5 percent increase compared to 2015. Eighty-eight percent of travelers, or 3.96 million New Englanders, will travel by car to their destinations – a 2.6 percent increase from last year when 3.86 million residents took cars to holiday getaways. More than 384,000 are expected to fly, which is a 3.1 percent increase over 2015’s 373,000 air travelers. 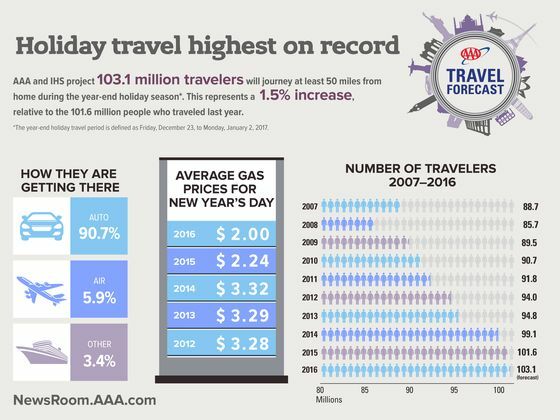 Nationally, AAA projects 103 million travelers over the Christmas-New Year holiday, topping last year’s 101.5 million end-of-year travelers by 1.5 percent. This marks the eighth consecutive year of growth for end-of-year holiday travel. “This holiday period is the longest one of the year and the most popular one for travelers because so many make it a priority to reunite with family and friends,” said Pat Moody manager of public affairs for AAA Northern New England. Gas prices will be very similar to last year’s holiday travel period, with averages in the $2.20-$2.30 range throughout most of New England. As North America’s largest motoring and leisure travel organization, AAA provides more than 56 million members with travel, insurance, financial, and automotive-related services. Operating 19 offices throughout Maine, New Hampshire and Vermont, AAA Northern New England is a not-for-profit, fully tax-paying corporation and serves as an advocate for the safety and security of all travelers. AAA Northern New England can be visited on the Internet at www.AAA.com.